A week passed since the Day of Solidarity with the Palestinians. But maybe it’s better that I waited a week before penning how that day made me feel. The UN once again proved itself to be a tool and platform for featuring a false Palestinian identity, whose mission isn’t to build itself but to destroy Israel – and, frankly, with that to destroy even what they have today. There is something incredibly dangerous in repetition. Hitler knew that. Mussolini knew that. Every dictator knew and knows that. Repetition is the mass murder of the ability and the desire to think other than what has been told to us. Repetition is the ultimate weapon of any propaganda machine. And frankly, at this point, no one can convince me about the opposite. Until the UN – besides the usual Israel-focused special meetings – dedicates a full day for nothing less than an Arab gathering with dozens of Palestinian keffiyeh visibly hanging on every second person, yes, until then, the UN is a propaganda machine. Shall we add that on this special UN Nakba day (and accept the denial from their end on this title though), on the ground floor of UN Headquarters, a new exhibition opened that features such incredible (sic) artists as Mohammad Sabaaneh, whose fame derives from nothing else than being antisemitic. How convenient is that to make him a star artist of “Palestine”, isn’t it? The exhibition is on display until January, and I think, this is when I lost it that day. While the legal terminology used during the UN meetings might not catch everyone’s attention and you need a good deal of attentiveness to decode some of the behind-the-words illegitimate expressions, showing art is the simplest way to get to the hearts. I don’t have issues displaying Palestinian Arab artists. But I do have an unresolvable issue with using artists for a political agenda (see BDS). And I have an even bigger issue with making this at the UN. While most of the Israelis at this point just shrug their shoulders and say something like: “Who cares about the UN?” “We should just leave.” “Why are you still surprised?” Most of the Americans believe that the UN is the God of all and it is here to give us peace, make up for the lost times we suffered during the two World Wars and to create an everlasting utopia. So it’s really not a rocket science to see why the UN is so dangerous. The majority of the general population would walk into the UN and assume that whatever is on display, it must be true. Whatever is being said, it must be factual. A very few people have the time, desire and willingness to read between the lines. And why would they? Who cares about the details apart from the Jewish (and I need to admit, mainly Israeli) people and some crazy non-Jewish people like me? We can’t blame them, can we? But we can, and we should, blame the UN for misinforming people under the mask of a legitimate intergovernmental institution. It is too easy to call on the fake news in mainstream media, but it takes knowledge and guts to call out the UN, and it is even more difficult to actually make an impact and change something. Why? Because those who care about this fight are lone fighters or simply gave up fighting somewhere between the ludicrous resolution declaring Zionism as a form of racism and the UNESCO resolution negating Jewish ties to Temple Mount. 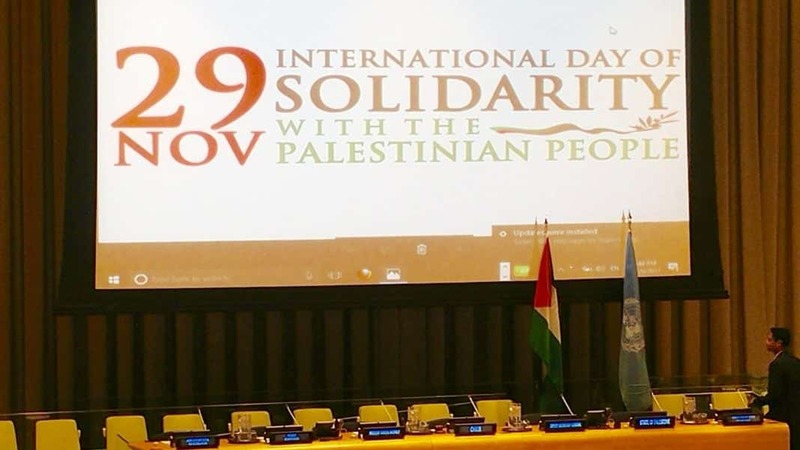 Where was the outrage after this solidarity day at the UN? Which Jewish journalist in any high-profile media had the guts and reported on it? And no, I am not interested in the Jewish media. That is simply not enough at this point. Where are the UN member states and their representatives questioning why they don’t get such a special day? Hungary, for one, would surely deserve a solidarity day post-Versailles where my country lost 2/3 of its territory and Hungarians turned into oppressed minority groups of the neighboring countries and still being a harassed population in these areas. And this is exactly why the UN’s anti-Israel stance is so transparent. You either care about everyone the same way, or you care for none. You either acknowledge every nation’s Nakba, or you don’t. But there are things that you simply can’t play by the ear. Here is a quote from Bernard Lewis, who, in my reading, hits the nail on how to spot whether anything or anyone is Anti-Israel or positively pro-Arab? It was a tough day to be at the UN that day. It was tough because I have enough self-awareness to know that if I would not have the experience and knowledge I have about Israel and UN affairs, chances are, I would be brainwashed. Because we all know that if you repeat a lie often enough, it becomes the truth. Or at least, the ‘illusion of truth,’ but who cares about semantics, right?